This is the second part of a series of “anatomy” lessons within Machinery Lubrication. In this issue, the oil filter will be examined to uncover its functional and performance characteristics. Several other related topics will also be discussed, including best practices for oil filter usage, possible filter failure modes, factors for proper filter selection and how to maintain an installed filter. By definition, an oil filter’s main role is to cleanse oil from destructive contaminants within a machine such as an engine, transmission, hydraulic system and other oil-dependent systems. In the case of automotive oil filters, canister-type filters are the most common. This filter configuration was most likely responsible for the advanced performance of oil filtration technology. In 1922, Ernest Sweetland invented the first oil filter device for automobiles. It was named the “Purolator,” which was short for “pure oil later.” The spin-on filters common in today’s automotive industry were introduced in the 1950s and were virtually a standard by the early 1970s. Aside from the automotive industry, oil filtration is an integral part of equipment within a wide variety of industries, including aerospace, power generation, oil refining, manufacturing, mining, etc. Although most current oil filter designs come in canister or cartridge types, several variations in size, filter media, dirt-holding capacities and flow arrangements are available. For this reason, it is important that filters and filtration systems are selected to meet the needs of the application and with cost, performance, ease of use and environmental conditions in mind. Oil filters can be characterized by the method in which the contaminants are filtered or the method in which the oil flows through the housing. One technique used to control contamination in filters is through surface-type media. This is the type of filter used in automobiles. In depth-type filters, the filter media are designed to hold much higher levels of contamination and provide a more circuitous path for lubricant contaminants to become trapped. Other possible contamination control methods include magnetic and centrifugal filtration. Magnetic filtration utilizes rare-earth magnets or electromagnets to attract and collect ferrous particles as the oil passes through a magnetic flux region. Centrifugal filtration works by integrating a rapidly rotating cylinder to produce a centrifugal force for contamination separation from the oil. Oil filters can also be categorized by the oil flow design. As its name implies, a full-flow filter will draw all of the oil through the filter media. On the other hand, a bypass filter only requires a fraction of the oil flow for sufficient flow rates within the system. The application’s oil flow and contamination control requirements will determine which design is the best option. Another alternative is the duplex filter system, which contains two side-by-side filters in parallel to allow one of the filters to be replaced during uninterrupted operation. 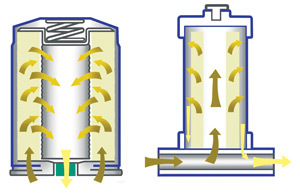 With typical canister-type filters, it is standard for oil to flow from the outside in. This means that the oil travels through the cylindrical filter media from the outward-facing surface into the inner core. However, in some cases the flow direction is reversed, with the oil coming into the filter through the core and pushed outward through a unique pleat design. This is intended to improve flow handling and distribution as well as reduce filter element size. Direct Interception and Depth Entrapment – Particle blockage on the media due to the particles being larger than the taken passages within the media. Adsorption – The electrostatic or molecular attraction of particles between the particles and the media. Inertial Impaction – Particles are impacted onto the filter media by inertia and held there by adsorption as the oil flows around. Brownian Movement – This causes particles smaller than 1 micron to move irrespectively of the fluid flow and results in the particles being adsorbed by media in close proximity. It is much less prevalent, especially in viscous fluids. Gravitation Effects – These allow much larger particles to settle away from fluid flow regions when there is low flow. Surface Retention – Contaminants are held at the surface of the media. This provides an opportunity for the contaminant to become trapped as it comes in contact with the media surface. Depth Retention – Contaminants are held either at the surface of the media or within the labyrinth of passages within the “depth” of the filter media. This creates several opportunities for contaminants to become trapped. 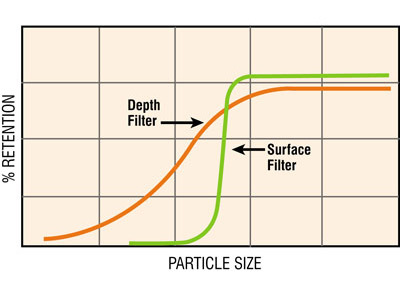 The graph below shows how depth-type filtration is more efficient in capturing smaller particles when compared to surface-type filters. This can be attributed to the deeper media providing more chances for the particles to be trapped along with the adsorptive and Brownian movement effects being more predominant in depth-type filters. While these characteristics are beneficial, depth-type filters tend to have higher differential pressure across the media as a result of the increased flow restriction from the deeper filter media. depth-type and surface-type filter media. Cellulose - Comprised of wood pulp with large fibers and an inconsistent pore size. Fiberglass (Synthetic) - Comprised of smaller, man-made glass fibers with a more consistent pore size. Composite - Comprised of a combination of cellulose and fiberglass material. Cellulose media are advantageous because they can absorb some water contamination. However, these types of media tend to fail more rapidly than synthetic media in acidic and harsh oil conditions. Nevertheless, the primary reason synthetic filter media are preferred is their more consistent porosity and smaller fiber size, which contributes to higher dirt-holding capacity and longevity of the filter. Oil filters are rated by a technique called the beta rating. In his Machinery Lubrication article “Understanding Filter Efficiency and Beta Ratios,” Jeremy Wright explained the methodology behind the beta rating in more detail. In short, the beta ratio is calculated by dividing the number of particles larger than a certain size upstream of the filter by the number of particles of the same size downstream of the filter. Every filter will have multiple beta ratios for different particle size limits such as 2, 5 or 10 microns. Storage - Filters can fail long before they are to be used for their intended purpose. Therefore, proper filter storage and handling are essential. Ensure filters are kept clean, cool and dry, and always follow the first-in/first-out rule. Installation - Even if a filter installation seems simple and routine, refer to the manufacturer’s recommendations for proper procedures. A classic mistake is over-tightening. Most recommendations suggest that a three-quarter turn after seal contact is optimal. Over- or under-tightening can inhibit the seal’s longevity and effectiveness. Confirm that connections, seals and ducts are fitted appropriately and are free of contaminants. Avoiding Pre-fill - In most cases, you do not want to pre-fill your oil filters before installation. In diesel engines, it is recommended that a pre-lube system be installed instead in order to counteract changes from dry-start conditions. Choosing Correctly - Many filters and filter housings are designed to be interchangeable, so just because a particular filter fits doesn’t mean it is the correct filter. Make sure each filter is replaced with the right filter. This may not necessarily be the one found on the machine, as an incorrect filter might have been used during the last filter change. Training - Proper training must be conducted for all personnel involved with changing filters. Remember, a task that seems straightforward to most people may not be for a new employee. Channeling - During high differential pressures, filter media passages can enlarge to a point where unfiltered oil can pass through without an efficient contaminant capture. In addition, any particles that were previously contained within the filter in line with the enlarged passage may now be set free. Fatigue Cracks - In cyclic flow conditions, cracks can form within the filter media, allowing a breach of oil to pass through unfiltered. Media Migration - Media fibers can deteriorate and produce new contaminants made up of filter material. This may be caused by improper placement of the filter housing or an inadequate fitting of the filter, which can generate damaging vibrations. Embrittlement from incompatible oils or extremely high differential pressures can also result in media disintegration. Plugging - During operation, filter media can become fully plugged by exceeding the dirt-holding capacity. Plugging can occur prematurely if excessive moisture, coolant or oxidative products like sludge are present. Structural Integrity - Arguably the most critical factor, structural integrity relates to a filter’s ability to prevent the passage of oil through an unfiltered flow path. The International Organization for Standardization (ISO) has established procedures for testing fabrication integrity, material compatibility, end load and flow fatigue. 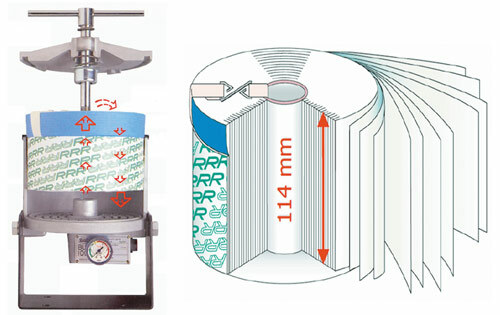 These tests can reveal defects such as improper sealing of seams and end caps or breaks in the media from high-flow conditions, as well as the effects of high temperatures on the filter element. Contamination (Dirt-Holding) Capacity - This refers to the amount of contaminants that can be loaded onto the filter before the filter’s efficiency is limited. Pressure Loss - This involves the overall differential pressure lost from the filter’s placement on the system. The pressure loss will be influenced by the filter media’s porosity and surface area. Particle Capture Efficiency - This is the overall effectiveness of the filtration mechanisms within the filter media to extract and retain contaminants from the oil. System/Environment - The characteristics of the system and environment in which the filter will be installed must be considered, including the contamination expectations, flow rates, location, vibration, etc. Ensure proper breathers are installed to prevent contaminants and moisture from entering the system. Keep seals and cylinders clean and dry by using appropriate wipers and boots. Select the appropriate oil grade and additive package to counter contaminant ingression and internal friction. A filter not only is a trap for the machine’s undesirables but also a concentration of clues as to what’s occurring within the machine. Particles within the oil may be so highly diluted that practical analysis can become a daunting challenge. However, the particles trapped in the filter may be so plentiful that they can be easily visible to the naked eye. Metal contaminants are a primary indication of an issue within the machine. Although some amount of metal contaminants can be expected, an unusual amount should be recognized by trending the filter’s visual appearance after each oil change. Cutting open the filter and suspending a strong magnet over it can aid in pulling out the metal contaminants to more easily distinguish them. If the machine is suspected to have an issue, the filter should not be discarded, as this would be similar to throwing away key pieces of evidence. Maintain the filter in the same condition as when it was removed and have it analyzed by the manufacturer or a laboratory. Oil filters are not designed to be dumped into any wastebasket. Increasing regulations by the Environmental Protection Agency dictate proper filter disposal. While each type of oil filter may have its own requirements, common practices include oil draining, crushing or incinerating the filter. Many disposal services or filter distribution centers will accept used oil filters at little or no cost.